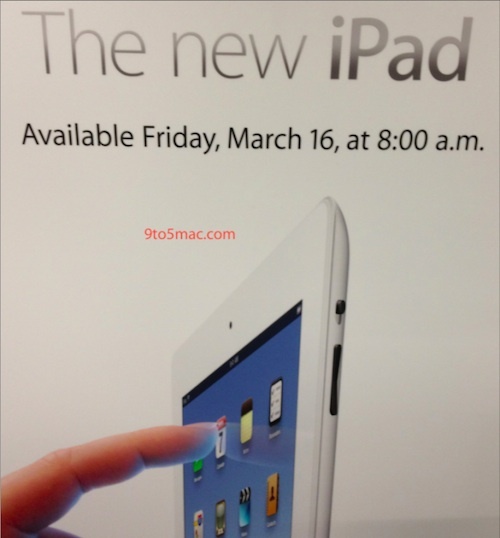 Yesterday, we noted that Apple's grand opening of its new Highland Village retail store scheduled for 8:00 AM on Friday hinted that the company was likely to planning to launch the new iPad at that time rather than in a late afternoon launch as was seen with the iPad 2. We received word soon after that visual merchandising staff at Apple's retail stores were scheduled for an overnight shift on Thursday night into Friday morning in order to prepare the store for a morning launch, and now 9to5Mac posts a photo from a retail store source showing some of the new signage going up this week confirming an 8:00 AM launch for the device on Friday. Apple's product launches have historically been scheduled by local time, so customers in any of the iPad launch countries with Apple retail stores should expect those stores to open at 8:00 AM in their local time zones. With Apple having sold out of its initial batch of online pre-orders for Friday delivery, those still looking to secure an iPad on launch day will need to wait in line at an Apple retail store or other launch retailer in hopes of obtaining one. Anyone lining up to scalp an iPad is simply taking advantage of a solid business opportunity. The truth is often unpopular. Or there are just some who enjoy/get a kick out of doing it occasionally. I'm and engineer , with wife and kids so it's not like its something I do often , and be it back for Star Wars tickets back in 99 (I saw the original opening in theaters also) or something like this , it's fun for some to sit all night under a nice night sky , in a comfortable chair , and shoot the breeze with fellow folks that 99.99% of the time are friendly , there for their own enthusiasm and enjoy the experience also. I know it's shocking to to some of you who like to be negative all the time on message boards (I miss the BBS days , wasnt that way then) , but there are plenty of folks who simply see it as a fun experience without any deep nefarious meaning to it nor a "sign of the times". People once camped out for concert to football tickets to big games , and enjoyed the social experience , and in my town there likely will be at least 2-3 hundred at the minimum lined up at the Apple store which is in a nice outside Mall location , low of 70 degrees that night forcasted , and many will bring food , music etc and have almost a party atmosphere with folks enjoying a night of talking that many don't get to do very often. Horrible isn't it , that some enjoy escaping from the normal routine and enjoy a night of being around others with like minded interests and meeting all sorts of new folks normally wouldnt ever have experience to do. Some of you just need to get a grip.It's not a "sign of the times" nor is society becoming worst or different , folks spents days in line in the 70's for certain concerts , and I dare say it's a more enjoyable experience for some than spending hours f5 refreshing to then wait for the fedex truck all day to sign for the package , to me anyway it is. The truth hurts for those who can't understand many simply enjoy the experience. Looks like some took a picture of a poster that wasn't laying flat. What can you do with 250MB? Seriously, that continues to be a joke. Personally, I like going to an Apple Store and physically handing over the money to receive my iPad rather than it just showing up on my porch. Plus, I think it'd be fun to wait in line with other people who love Apple. That’s cool. I was genuinely curious about folks hitting up the store vs. online (and I figured it was the experience or missing the opp for an early pre-order).